I feel like poopy. I have a headache and yucky cold. 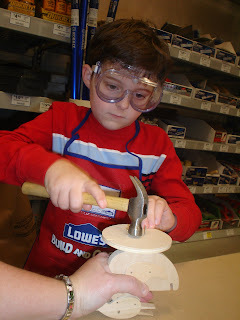 Here are some pictures from the Build it at Lowe's on Saturday. Ryan loved it and asked for 2 extra turkeys so he can give one to each Grandma. He always looks so cute in those goggles. I have been sick too. I have a nasty cold and fever, it stinks! I sure hope you feel better soon! I'm glad you got to make the turkey! I hope you feel better real soon. It's no fun being sick!! You sicko. I hope you feel better soon.I would tell you to take a nap but I know Ryan will be out of school soon if not already. I am sorry you don't feel well. I hope you are doing better. I love the pictures of him in the goggles. He looks so cute! 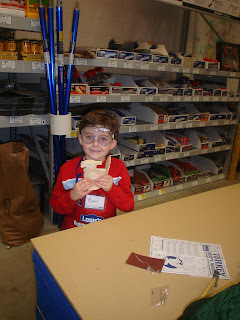 I thought the same thing about the goggles...very cute!